Freiburg plant biologist Prof. Dr. Thomas Laux and his research group have published an article in the journal Developmental Cell presenting initial findings on how shoot stem cells in plants form during embryogenesis, the process of embryonic development. Pluripotent stem cells can develop into any type of cell in an organism. In contrast to animals, plants can form completely new organs from their stem cells throughout their lives, which in the case of several species of trees may span a thousand years or more. Stem cell research promises to solve key problems in medicine and plant breeding. However, whereas the function of stem cells for the regeneration of tissue or for growth has been studied in detail, much less is known so far about how stem cells form in the course of embryonic development. 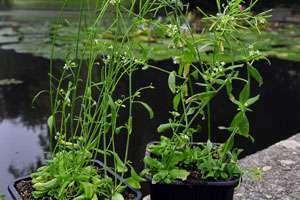 Several years ago, Laux and his team already discovered the transcription factor responsible for the continuous replacement of shoot stem cells in the model plant Arabidopsis, commonly known as thale cress. Called WUSCHEL, this protein is already present in the embryo when the stem cells form. "Much to our surprise, our PhD student Zhongjuan Zhang made the key observation that it is not WUSCHEL but the related transcription factor WOX2 that is responsible for the development of the stem cells," says Laux. All that was previously known about the protein WOX2 was that it controls earlier steps in the pattern formation of the embryo, the phase in which the embryo's cells arrange themselves in a particular structure. Zhang discovered that WOX2 prevents the cells in the region of the embryo in which the stem cells form from differentiating into specialized cell types and thus from losing their unlimited potential for development. This means that plants follow similar strategies in the process of stem cell development as found in animals. In the case of Arabidopsis, WOX2 regulates the balance between the two plant hormones cytokinin and auxin by allowing relatively large amounts of the former and relatively small amounts of the latter to collect in the progenitor cells of the stem cells. Plant researchers have already been using this mechanism for several decades to regenerate a shoot from a root or a leaf. This method, originally found in tissue cultures, therefore ultimately reflects the same mechanism that evolution already found much earlier to develop stem cells during embryogenesis. Thomas Laux is head of a laboratory at the Institute of Biology III and a member of the University of Freiburg's Cluster of Excellence BIOSS Centre for Biological Signalling Studies.